Images in the gallery app, called Photos, can be viewed in either portrait or landscape mode - there's no auto-rotation though. In landscape mode, images load full screen. Photos can be organized into albums, viewed in timeline (they are ordered by the date they were taken) and sorted by date, name or size. Slideshows with selectable transition effects are also an option. As for the regular Gallery app, it's still here - but it's hidden in the Applications menu. It's more of a file manager that also supports picture viewing, though. It can manage folders and files - both one by one and in bulk. The music player of the Nokia 515 has a basic set of features and brings supports for the most popular formats. The player handles MP3, WMA, WAV and eAAC+. Tracks can be filtered by artist, album and genre. Naturally, the A2DP profile is supported, allowing Bluetooth streaming of stereo sound. An RDS-enabled FM radio is available on the Nokia 515 as well and it can play through the powerful loudspeaker. Thanks to the built-on FM antenna, you can start the app almost instantly with just one key stroke (the media control on the left side of the phone). The FM radio starts playing immediately. 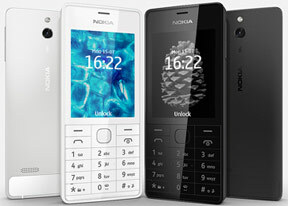 In terms of video playback the Nokia 515 supports MP4, H.264, H.263 and 3GP. Let's face it, watching a movie on this small low-res display is not exactly pleasurable, so we doubt anyone will give this feature much consideration. Playing the occasional clip someone sent you via MMS is as much use as this player might be getting. Videos can be played in fullscreen mode, and you get pause and skip buttons. The Nokia 515 comes with the familiar Nokia web browser. Its start screen has the usual URL and search bars and three side-scrollable panes below, which are quite reminiscent of the Symbian homescreen (complete with the three dots at the bottom that indicate the current pane). From left to right, the panes are History, Featured (lists popular sites in several categories) and Favorites. The browser uses the Opera Mini trick - compressing web pages on a dedicated server before sending them to the phone. Pages load quicker this way (particularly on slower networks) and don't waste much data. Image quality is adjustable (Best/Good/Average or No images). The performance is not going to make your head spin, not by a longshot. It can't use its feature phone status as an excuse either, because it's not the cheapest one around. The Calendar is the full-featured app that has month, week, and day modes and five types of events to set up. It's nowhere near the standards set by the smartphones around, even the entry-level ones. The alarm clock is repeatable: it can be set to go off on any selected day of the week, even when the phone is switched off. The other organizing features available include a voice recorder with a 60-minute limit, a stopwatch and a countdown timer. The Nokia 515's calculator offers two versions - basic and advanced. In addition, a loan calculator is also available. The consistently useful unit converter tops the list of additional applications. The Nokia 515 also includes Notes, Countdown timer, To-Do List and World Clock apps.